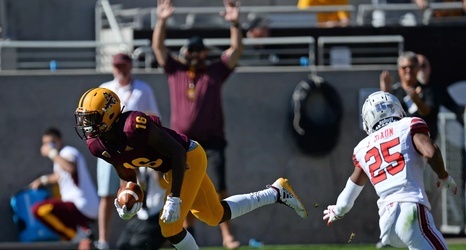 The Arizona State Sun Devils have had issues with defense this season. In their first eight games, they only had three interceptions, and this was one of the issues that was holding them back from making significant progress under first year head coach Herm Edwards. Defensive Coordinator Danny Gonzales has brought his unique 3-3-5 defensive scheme with him from San Diego State—three lineman, three linebackers, and five in the secondary. They had some growing pains at the beginning of the season and their low projection for success had more to do with their lack of defense than their lack of offense.